Image: ESO/H. Drass et al. Astronomers working with the Very Large Telescope in Chile have captured the deepest view yet of the heart of the Orion Nebula. Wow. 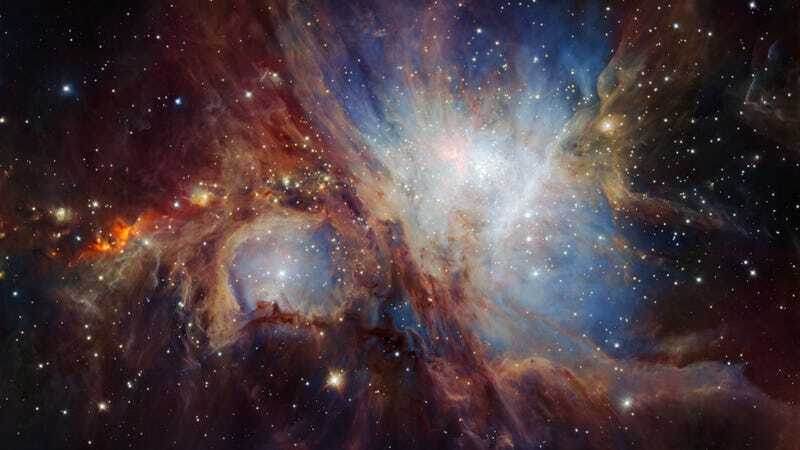 Located 1,350 light-years from the sun, the Orion Nebula star-formation measures about 24 light-years across. It’s visible to the naked eye, appearing as a fuzzy patch in Orion’s sword. Like other nebulae, Orion is illuminated by the many hot stars that are spawned within it, along with the glowing plasma clouds that have been stripped of their electrons from the ensuing ultraviolet radiation. Scientists used the HAWK-I infrared instrument mounted to the VLT to capture this image, but it produced more than just a pretty picture. The new survey has revealed a treasure trove of low-mass objects, suggesting this stellar expanse is probably forming more low-mass objects than star formation regions. Close-ups of the Orion Nebula. Image: ESO/H. Drass et al. Observations show that there are more planet-sized objects within this region than previously thought. The researchers also found about ten times as many brown dwarfs (objects that blur the line between gas giants and stars) compared to previous surveys.